If weather permits, why not have the shower outdoors? This was under the carport of our home so if a cloud happened to let loose a few sprinkles, we wouldn't risk melting. 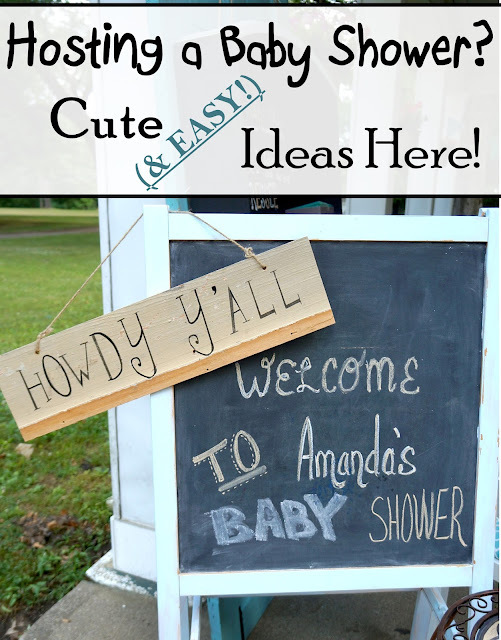 Greet guests with a cute sign! 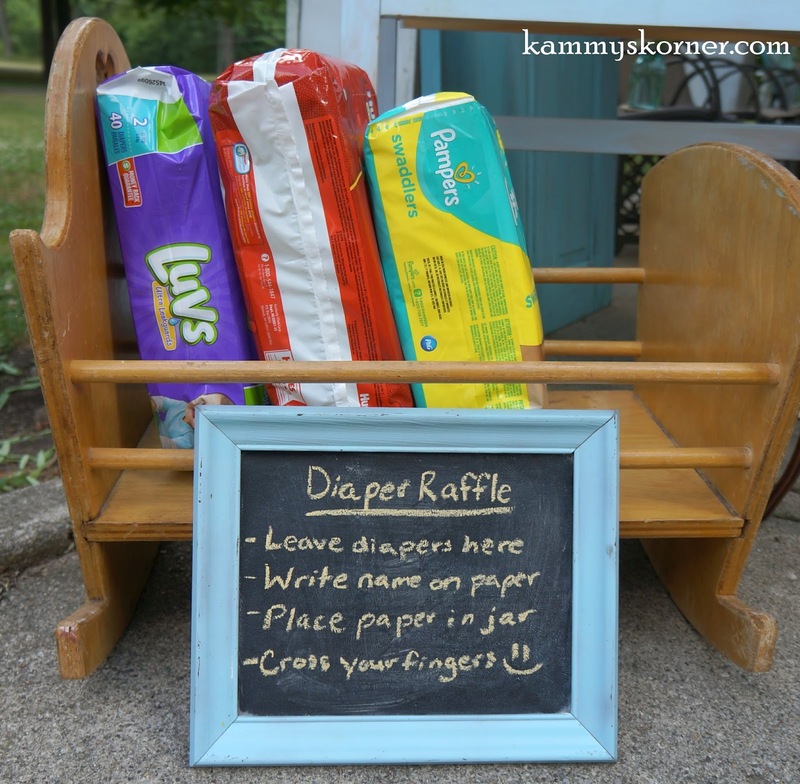 Guests were told in the invite to bring a package or diapers if they wished to be in the "diaper raffle". The winner was drawn randomly during the games and won a gift card. 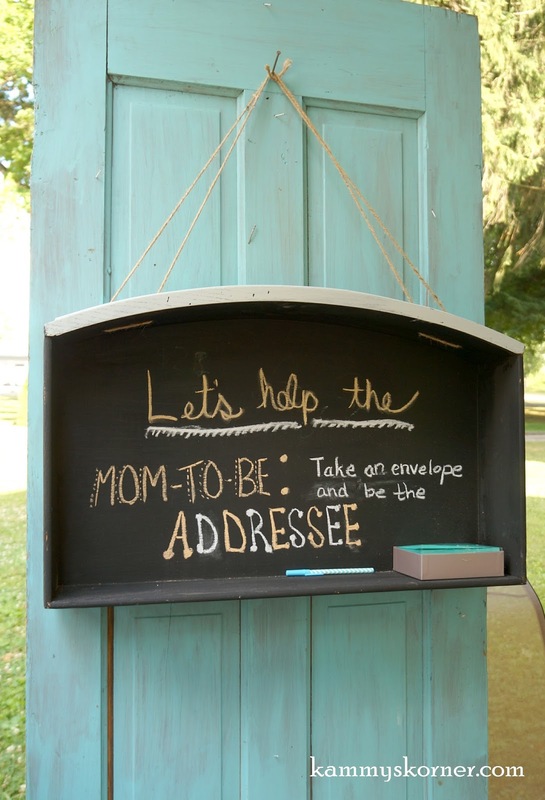 Gathering addresses for sending out thank you notes can be a pain in the you know what. 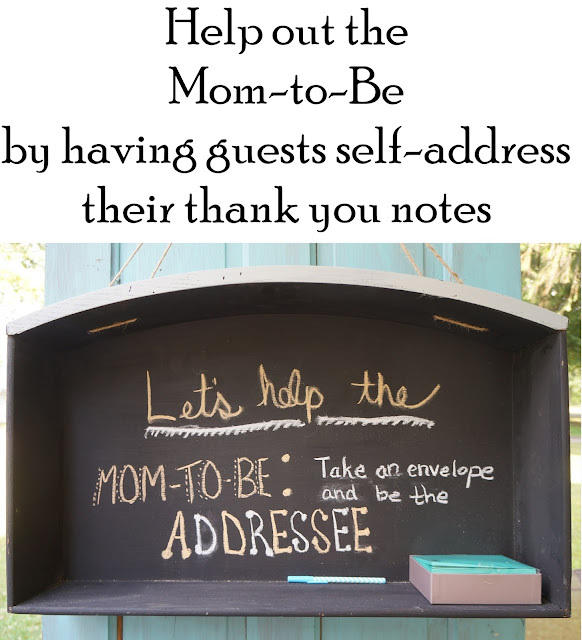 So why not help the mom-to-be out and have the notes already bought and have guests write their addresses on them? Phew! 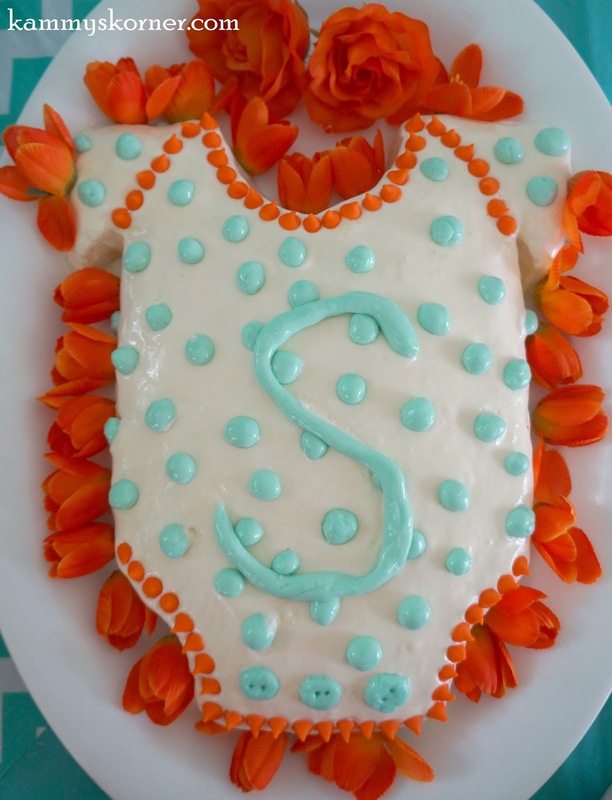 One job checked off the list for mamma! 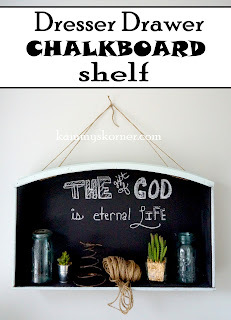 See how I repurposed this dresser drawer HERE. Now let's see some decorations! 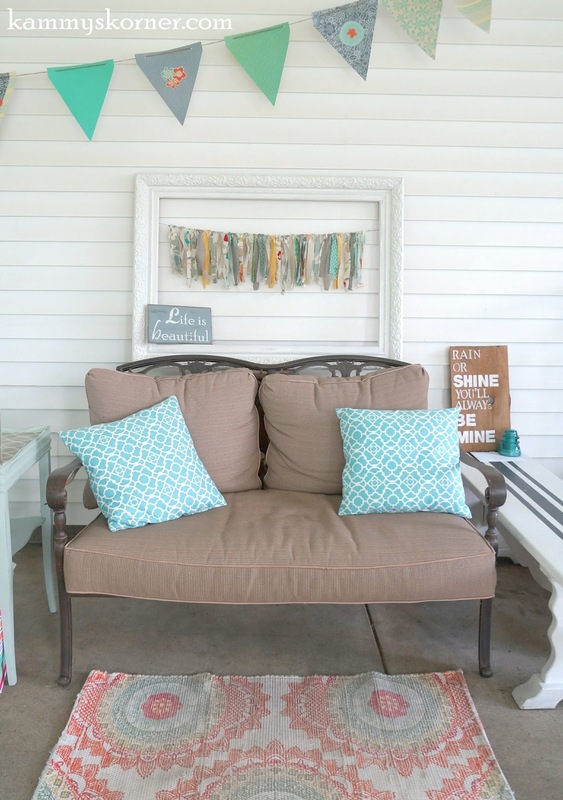 Mix outdoor furniture with indoor decor! 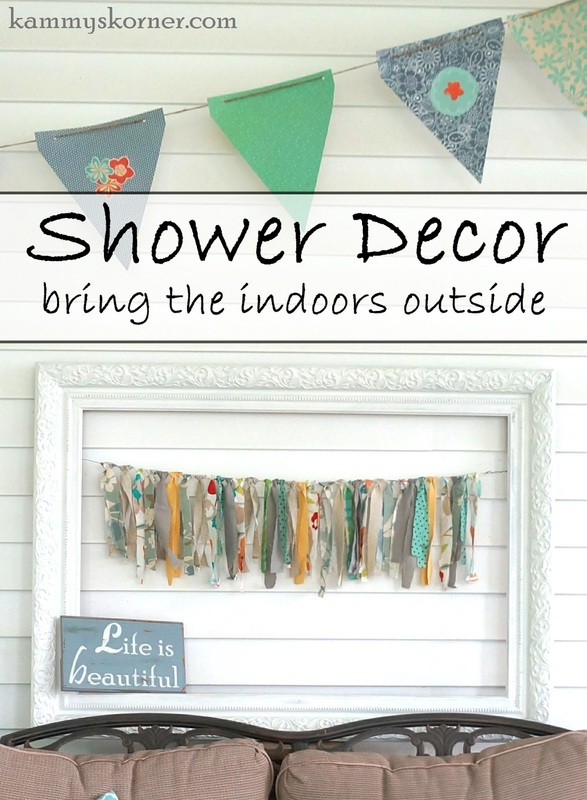 If you're hosting your party outdoors, bring the indoors out. We made our spaces cozy with throw rugs and other textiles. We brought throw rugs out from in the house if they had any coordinating colors in them, as well as throw pillows. We added the bench (which is normally our indoor dining seating) to set the gifts on so they were easily accessible for miss mom-to-be. The frame with the rag swag was taken from it's spot over the mantel in the master bedroom. 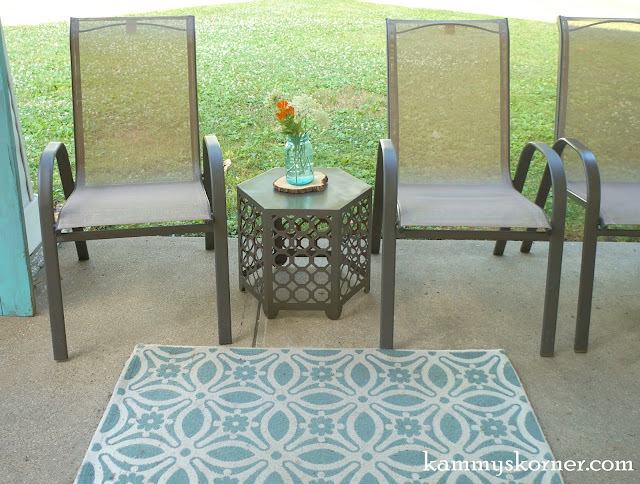 Having small tables in between chairs or a coffee table placed in front of a few is a MUST so guests have somewhere to set their drink. Nothing more awkward than having nowhere to set your punch or tripping over someone's on the ground! 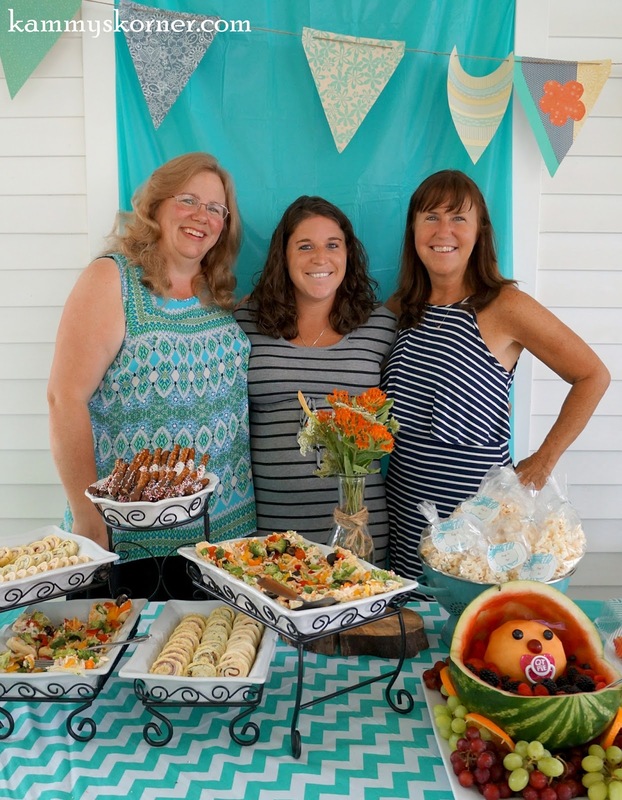 Why spend money on flowers or center pieces? 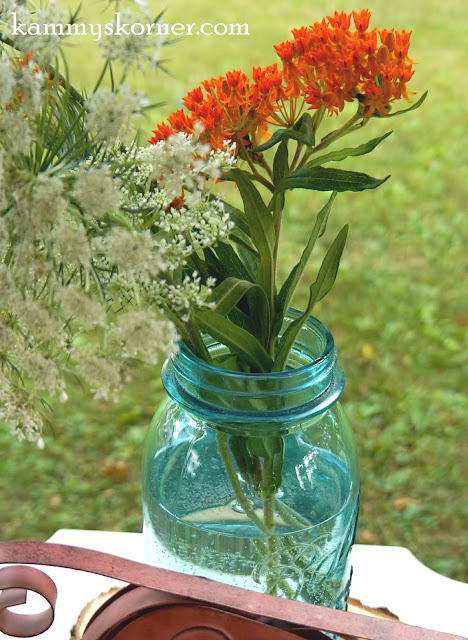 These beauties were found on the roadside and put in blue ball jars from my hutch and mantel vignettes. Extra bonus: Going on a hunt for flowers while walking with my six year old daughter! Let's get to everyone's favorite part, shall we? FOOD! This adorable "fruit baby" was crafted by one of our gracious hostesses, Jennah. 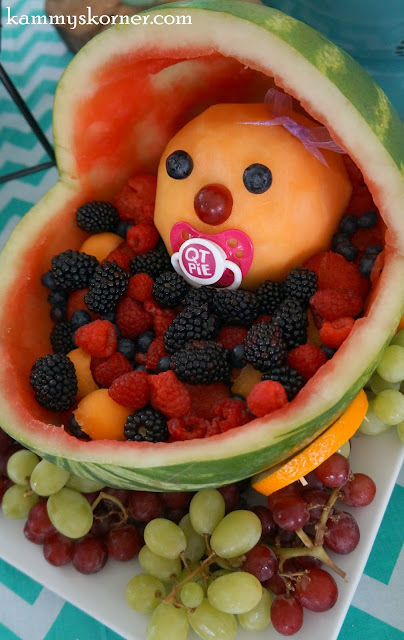 The carriage (or bassinet) is made from a hollowed out watermelon, the head from a cantaloupe, and I'm asking myself why I'm even bothering to explain any of this because I'd say it's rather self explanatory so I'll stop now! 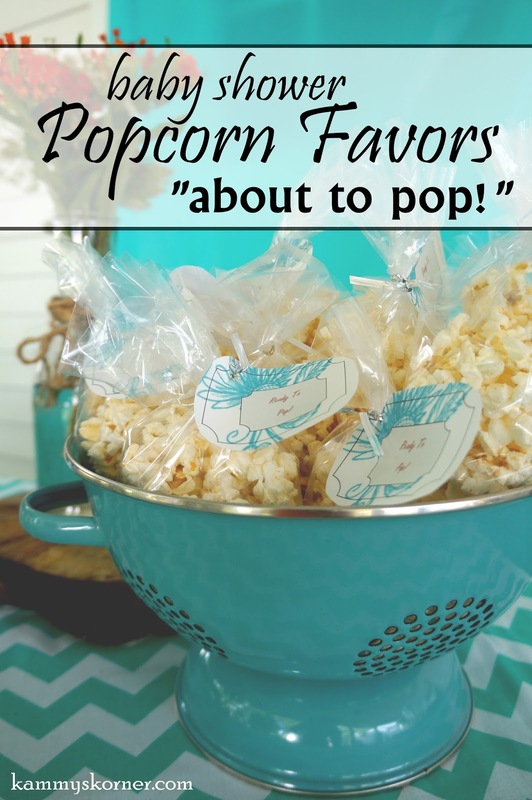 Lime flavored popcorn baggies with a label that says "about to pop!" is a perfect treat with a play on words since mom is "about to pop!" 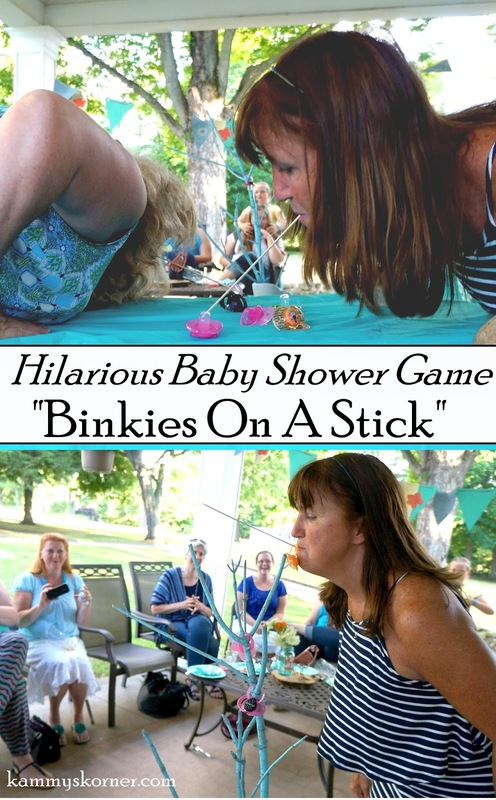 How about some funny but not corny baby shower games? We decided to put the grandma's against each other for a "binky on a stick" race and it turned hysterical! We kept the grandmas in this race and added our mom-to-be to the mix as well! the table in front of the contestants and they were given one minute to put on as many diapers as they could. Looks like fun! 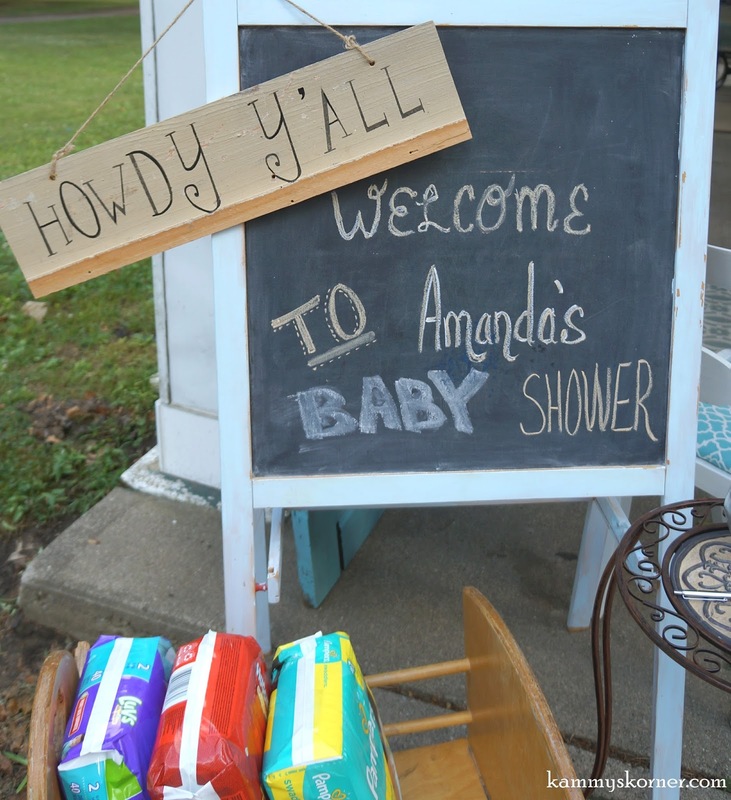 In our part of the country, guests would either melt from heat or be drenched in a REAL shower! That looks so cute, and not insanely hot. 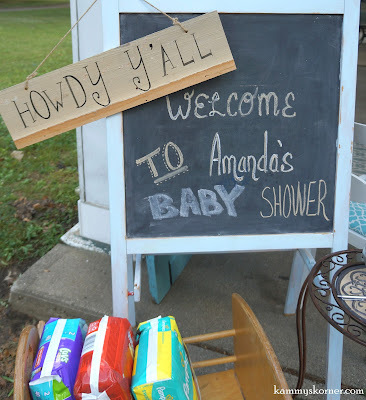 I might get shanked if I were to host a summer baby shower in my carport. So cute. Way to go!